Oliver Gildart is hoping a combination of fun and experience can help make Wigan’s left edge a potent attacking force. The centre played in the same school team as Joe Burgess, who returned from injury against Salford last week. 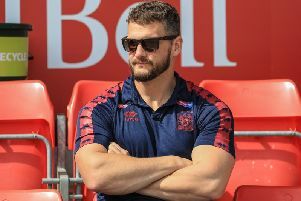 And with George Williams alongside them, the academy-products have honed their slick link-ups over years – part of the reason why coach Adrian Lam has backed them to become one of Super League’s most lethal edges. Gildart said: “It feels miles more composed with Budge back. “I know those two more than anyone in the team and we enjoy ourselves a bit more, and we showed that on the pitch. “I just think with Budge and George, if there’s a little break, it’s easier to anticipate and support – just because I’ve seen them play so many times I sort of know what they’e going to do. They are next in action in Sunday’s home match against Catalans Dragons – which will see another of their close mates, Lewis Tierney, line up opposite. “I’ve already messaged Lewis and told him he’s having it this week!” smiled Gildart. “It’s three-against-one, so he’ll get some stick. “Catalans are very physical, they always have been and they’ve played some good stuff this year. “The win against Salford only mattered if we win again, and the week later.